For some of your children school went back this week.. for WA it's not until next Monday. Master T is off to Pre-Primary (first full time year). Im excited but then I realised this is the start of daily school runs for me for the next 15 years! This means we need a good routine. Master T gets a little sick of me 'nagging' him so i thought id make him a chart for his room so he can see what he needs to do instead. Once Miss S is at school I'll pop it near school bags or in the activity room. If you think this chart would work well in your house you can download your FREE copy but simply clicking the image. This will take you to the download link. It will print on A4 paper for you to trim down to 8x10" size. You could even frame it and use white board marker to tick off the activities as they are done. *** FOR PERSONAL USE ONLY. Watermark will not be on your downloaded copy. Love it! Thanks Leanne, you creative lady! Great article. Keep sharing such a post. 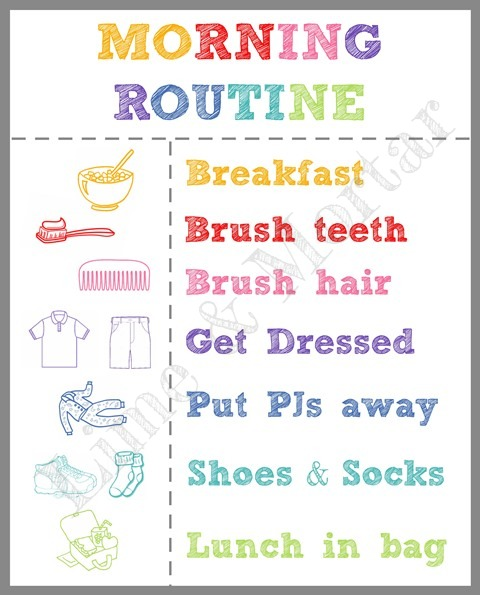 that is especially designed to help parents with the dreaded morning routine for school.